Today we are looking at One Piece: Bounty Rush published by BANDAI NAMCO. 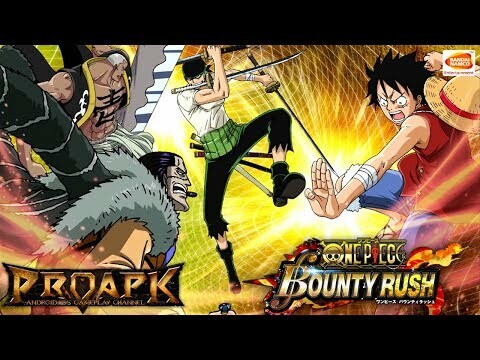 In One Piece Bounty Rush players will go up against other players from around the world in 4v4 action-based matches where the team who has the most coins by the end of the battle wins. Each team starts on an opposite end of the game map and tries to collect coins either through exploration or combat. There are AI enemies on the field to engage along the way that will drop coins or other useful items as well as include some very tough to beat boss class opponents. Teams can always go after their opponents’ treasure chests as well, that is if they can get past whatever defensive measures the other team has set up. Combat has sort of a classic Dynasty Warriors “Musou” vibe to it, with its straightforward hack-and-slash aesthetics. But each selectable character has their own traits and fits into one of five character classes in the game. For instance, Yuffie is a fighter class, focused on beating up enemies while Nami is a supporter class who can heal teammates or offer buffs. Other classes include Shooter, Swordsman, and Warrior. So, we are in the gameplay section and it is time to make a gameplay review and see what is this game about. I got a chance to sit down with One Piece Bounty Rush’s Brand Manager Yoshinobu Takabayashi during the event to see if I could dig up some buried treasure in the form of a few extra details about what fans can expect from the upcoming mobile title. Please note that all questions were asked and answered through a translator. Shacknews: Can you give us a quick overview of One Piece Bounty Rush? Yoshinobu Takabayashi: One Piece Bounty Rush is a team vs team real-time game. One team has up to four people, so up to eight people battle each other at the same time on a battlefield based off a setting from One Piece. The goal of the game is to collect the most coins you can. The team with more coins wins the battle. Shacknews: I noticed when I was playing, my characters kept leveling up as I was progressing through the battle. Does that carry over to each new battle, or is there sort of a starting point for everybody each time? Takabayashi: Each game has a two character leveling system. One is that you can level up your character by getting them in-game items. You can get those items from the story mode. And the battlefield: you can level up your character by getting the game items on the battlefield. All I can say about this game is that: it is fun! Overall I think that this is one fun game.